It's 89 days before Christmas. Did you start shopping for gifts already? If not, then better start a careful review of each inaanak (goddaughter/ godson) you have. Take note of their age and preference when it comes to things. For example, girls love pink stuff in general while boys love blue. Also, girls love cute and girly things while boys love sporty or techie items. 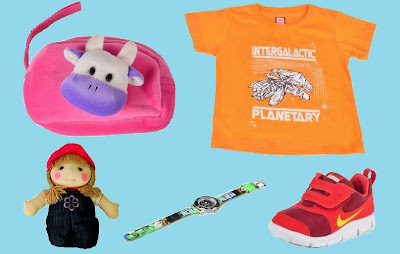 To help you with your shopping, I have here a ninong/ninang bucketlist with my top 3 ideal Christmas gifts for kids. 1. Toys - Kids are kids and when you say Christmas, of course toys come first! For a toddler, it could be a it, a stuffed toy or some wooden blocks. For a preschooler like my elder daughter, a toy laptop will do, a DVD of her favorite cartoon character or a bicycle. 2. Accessories - Kids love to accessorize. Buy your inaanak a new bag or a fancy watch. Got a bigger budget? How about a jewelry set? Anyway, you tend to be extra sweet and thoughtful for the holidays, right? 3. Clothing - One can never go wrong buying clothes as Christmas gift. Besides, children love to show off wearing something new. If you are not sure how big your godchild had grown up, just get something which is 2 size bigger than what you bought the previous year. As a godmother, I am as excited as my bunch of inaanak when 'ber' months come. I have a stash of Christmas gifts in my closet and believe it or not, I started collecting as early as January. I normally shop during a mallwide sale but I also look for discounted gift items online. These days, Lazada PH is one of the online shops that I visit the most. I love the fact that they carry a lot of brands of children clothes and accessories. Plus, they also have toys and babies specials where I can see so many choices best price guaranteed. Great tips,,I do not have a lot of inaaks, but my Bf has a lot, so I am also the one's nahihirapan na mag isip ng ibibigay..
Agree, shop for gifts whole year round to avoid cramming when it's nearing Christmas.